Russia leader Vladimir Putin no too dey popular wit im kontri pipo dis days, but e fit don come up wit solution to di problem - im own Reality TV show. Di launch of di new series on Sunday ontop Russia state television dey come even as thousands of pipo do I no go gree for Red Square ontop pension reform and goment plan to raise di retirement age. Di one-hour show wey dem call "Moscow. Kremlin. Putin," wey torch-light wetin di leader dey do behind camera, na sometin wey Putin neva do before-before. For inside di show, you go see di 65 year old leader as e waka, eight kilometres, climb mountain pick fruits and also interact wit children dem. "Dis na exercise, dis na just our own exercise." Na so Putin tok inside di feem. Di feem promote di president fitness, strength, e love for children and e human side. Dem go show di series every week ontop di state television. For March 2018, Vladimir Putin win anoda six year term to run as president. 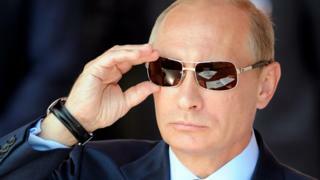 Since 1999, Putin don dey power as either president or prime minister of di kontri.